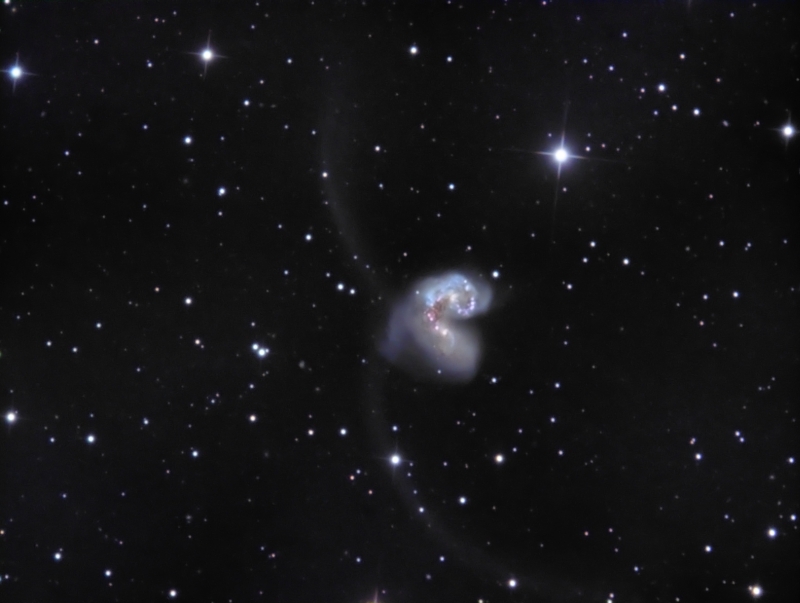 NGC 4038 (and NGC4039 or the Antennae Galaxies) is a mag 11.2 (visual) pair of interacting galaxies in the constellation of Corvus. The galaxies are colliding and the interaction and resulting compression of gas and dust is creating a tremendous starburst effect (rapid stellar creation), which shows up in the bright blue 'knots' in the central lobes. This object is noted for two long star stream 'tails' that resemble giant insect antennae. The distance from Earth is estimated at 45 million light years. Corvus lies low in the Southern sky from my observatory at a declination of -19 degrees and imaging is very difficult when the object barely gets to 30 degrees above the horizon. The dense atmosphere that exists between the telescope and the object distorts the image and reduces the resolution that can be obtained. This is an interesting object, however, so we get what we can. The main components of the colliding galaxies and even the 'antennae' were captured in the image. Exposure: LRGB: L:24x10min R:21x8 min, G:11x6 min, B:24x10 min for a total of 11.9 hrs.